Officers investigate the scene where a body was found Saturday in South Surrey. Police say the body appears to have been in the water some time. 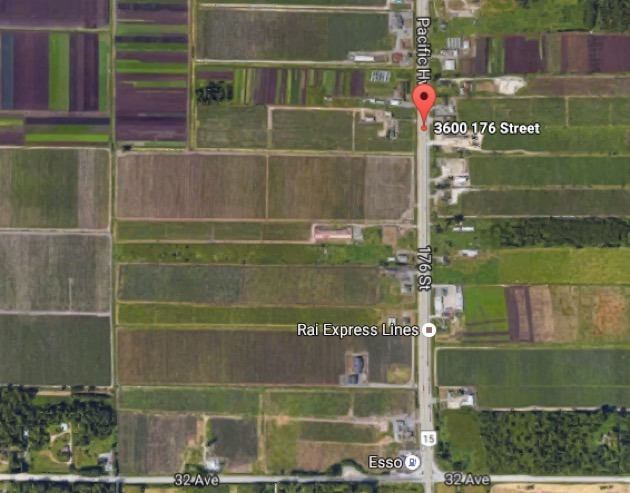 Nov. 26, 2016 1:00 p.m.
A body was found in a ditch Saturday afternoon along 176 Street in South Surrey, police said. Mounties were contacted around 2:50 p.m., after two people who had been out walking spotted the remains in the 3600 block. Police said it appears the body had been in the water for some time. The cause of death is not yet confirmed. Surrey RCMP’s major crime unit responded, along with forensic and collision reconstruction teams. No word yet from the Integrated Homicide Investigation Team. Police did not provide details on the age or gender of the body, though they did say nothing indicated at the time that this case is related to any ongoing investigations. Officers closed 176 Street at 32 Avenue for northbound traffic and did not say when it might re-open. Anyone with information is asked to contact Surrey RCMP at 604-599-0502 or Crime Stoppers at 1-800-222-8477 or www.solvecrime.ca.